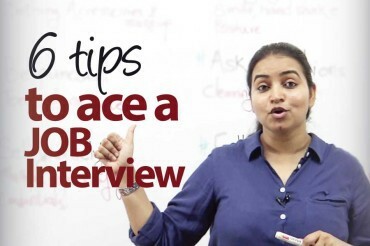 Hey Skillopedia subscribers, welcome to today’s session with me, Niharika your trainer and coach for Self improvement and personality development. 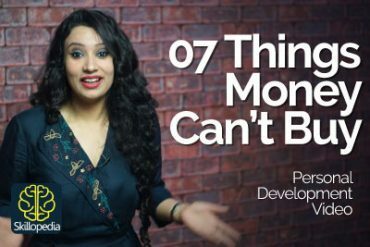 Today I will talk about awesome little things you could do in 15 min everyday to boost your self confidence, motivation and inspiration to lead a better life. This session is a bit different from my regular communication skills and public speaking tips, here I will talk about how you could develop habits that would make a positive change in your life. Watch the complete session and let me know in the comments what do you think. Hey there, it’s me Niharika. Well thank you for taking out these 15 minutes to browse through our Channel. Yes our life is so busy, that taking out 15 minutes have to be appreciated. Well, I promise that if you take out these 15 minutes to browse through our channel, you are definitely gonna gain a lot. Well in today’s session I want to emphasize the value of time. Not any time but time, as less than 15 minutes. Now if you thought that 15 minutes is just too less, I wouldn’t completely agree with you. Simply because there are a lot of things that you can accomplish in 15 minutes. And of course I must add useful things. So stay tuned with me, I’m gonna help you with certain things that you can do in 15 minutes and trust me that’s gonna be valuable. Well the first and the most important thing is ‘LIGHT EXERCISES’. Yes, when you wake up, you are a little grumpy and even lazy like you just don’t wanna get out of the bed, however if you spare 15 minutes of your time to indulge in ‘light exercise’, it will definitely bring a spring in your step. You will definitely feel active and of course getting up a little more fit than before. So go ahead try around 20 push-ups or do a little bit of stretching or whatever suits your style. You just need to get that body in shape and that never hurts, right? Of course that’s gonna make you look good too. So light exercise, just for 15 minutes will do great. Hey here’s another thing that you can do ‘DE-CLUTTER’. I believe that when we indulge in an act, that involves clearing away the clutter, it brings positivity, it gives you the sense of that accomplishment that you have brought everything in order and discipline. Now if I have a messy closet, I kind of neatly arrange the rack of clothes and I feel so good about it, like when I open my closet and I’m like ah, ah it looks awesome. Moreover it also pays off to have an organized wardrobe. Now for others it could be arranging the dishes or probably just arranging your office space and guess what to ‘de-clutter’ these things, it just takes 15 minutes and you feel great about it. Here’s the next thing, ‘ME TIME’. Why not give these amazing 15 minutes to yourself? It’s definitely going to make you love yourself more. But let me tell you, all you are like simply awesome. So you better indulge in some ‘me time’. Now this ‘me time’ can be reading your favorite book, dancing or probably just listening to your favorite music, watching your favorite show or probably just enjoying this amazing scrumptious yummy ice cream. Well, time for you to go love yourself. Here’s the next one ‘STRENGTHEN RELATIONSHIPS’. Now if you have that extra 15 minutes, make that phone call to your grand mom. Tell her that you really miss her. Or if you stay away from your parents, just call them and talk to them. Or probably it’s your friend who has moved to a different country. Well healthy relationships make you grow on a very personal level. So take that 15 minutes to nurture and strengthen your relationships with others. There’s another interesting thing that you can do, ‘FIX SOMETHING THAT’S BROKEN’. Now when we get something fixed, it actually gives us a sense of relief of not having to deal with it anymore. Yes, you know if something is not functioning and you were just postponing it for a later weekend that, “hey, I’ll fix it later” but if you do it now, guess what? That thing is already functioning and you’re happy about it. So go get that bulb changed, go get a plumber and get your leaky pipes fixed or just you know fix things that needs to be fixed, maybe your car tyre or anything for that matter. But do get it fixed in that 15 minutes. Well here’s the next thing that you can do, ‘WRITE A JOURNAL’ or a ‘DIARY’. Well writing a journal or a diary gives you a perspective about your own lives. Which is also very important, right? Now when you write a journal, try to ask yourself certain questions. Questions about your professional work or about your personal. What you really want to work on. Any kind of a bad behavior that you really want to bring in a change. Or probably a bad habit that you want to get rid of. So just try to make a list of these things and another thing that you can add to your journal or to your diary are the things that you are really grateful about. Well these things will really make you happy when you read it on later basis. So these 15 minutes, well can be pretty helpful to you. Oh well, the other one is the best one because it really helps me too ‘TAKE A POWER NAP’. You know there are so many people who have always mentioned that when you take a nap for as less as 15 minutes your internal system gets some rest. You get the sudden burst of energy and alertness which kind of increases your overall performance in whatever you are doing. So a small nap is almost like an energy booster. So do the most relaxing thing and take ‘power nap’. It will definitely bring in changes in your health as well. Previous Previous post: 10 Common English Grammar Mistakes & Errors made while learning English. 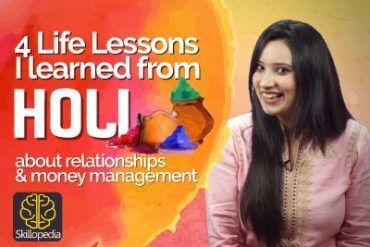 4 Life lessons I learned from Holi about Relationships & Money management.